In a perfect world, every reissue would be as thoughtfully and lovingly compiled as Castle/Sequel's excellent She Flies Like a Bird: The Honeybus Anthology is. 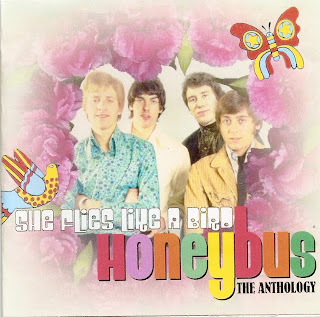 There have been various reissues of the group's recordings, including reissues of their 1970 album Story, and See for Miles had previously released a 25-song compilation, Honeybus at Their Best, but this impressive two-CD set easily outshines them all. She Flies Like a Bird collects all of the band's original mid- to late-'60s recordings for their label, Deram, adding a rare Italian single, "La Cigona (She Sold Blackpool Rock)" b/w "Chi Sei Tu (Ceilings No. 2)" and a half-a-dozen previously unreleased BBC sessions. One of these -- "Maxine's Parlour" -- was written by obscure introspective singer/songwriter Bill Fay, whose very first single was issued by Deram in 1967; it was never issued as a Honeybus single, having already been promised to labelmates Crocheted Doughnut Ring. Another of the BBC tracks -- "Like an Old-Time Movie" -- was penned by John Phillips. Additional highlights include previously unreleased demos and several tracks from an unreleased 1973 album, Recital; Honeybus had recorded an album's worth of material for Warner Bros., but, due to contractual harangues, they decided to have Recital pulled before it was scheduled for release. Several early-'70s non-album tracks (some of them were previously issued on the band's out of print Old Masters, Hidden Treasures compilation) are also included. The eight-panel CD booklet unfolds to reveal insightful annotations by noted authority David Wells. Graphic designer Paul Bevoir has also done a wonderful job with his clever assemblage of rare or previously unused photos, all of the band's single sleeves and labels, sheet music, and various clippings and adverts (one side of the foldout is in color, the other is in black and white). The double-CD jewel case is housed in a nicely designed sleeve slipcase, too. There are 50 tracks in total, spread out over both CDs. Some fans might grouse that Sequel could have also found a way to include post-1970 solo recordings by various members (especially tracks from Pete Dello and friends' Into Your Ears or Colin Hare's highly regarded March Hare). Until that happens, She Flies Like a Bird is the most definitive Honeybus release yet.